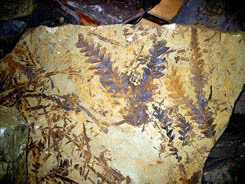 These forked ferns are characteristic of what has become known as Gondwana Land Fossils. They are technically known as Dicroidums, which translates as split into two. They were a puzzle for many years until it was discovered they were not ordinary ferns which have spores, but Dicroidiums ferns had seeds. Sadly these unusual seed ferns seem to be extinct. Today�s world has fewer fern types than the world these ferns came from.